I know it looks like the only dishes I make are Barefoot Contessa recipes. Especially if you are new to the redesigned Food Revival. But here’s the thing: I have some “go to” recipes that never fail and they tend to be hers. And now that I have a one-year-old and I am usually desperate for “go to” recipes I know will work, well… you can expect to see some Barefoot Contessa recipes all up on this blog. But why am I even defending myself? I mean, LOOK at this Cauliflower Gratin. Bonus? One item (cauliflower) found in my CSA bag is dealt with this week. Double Score. 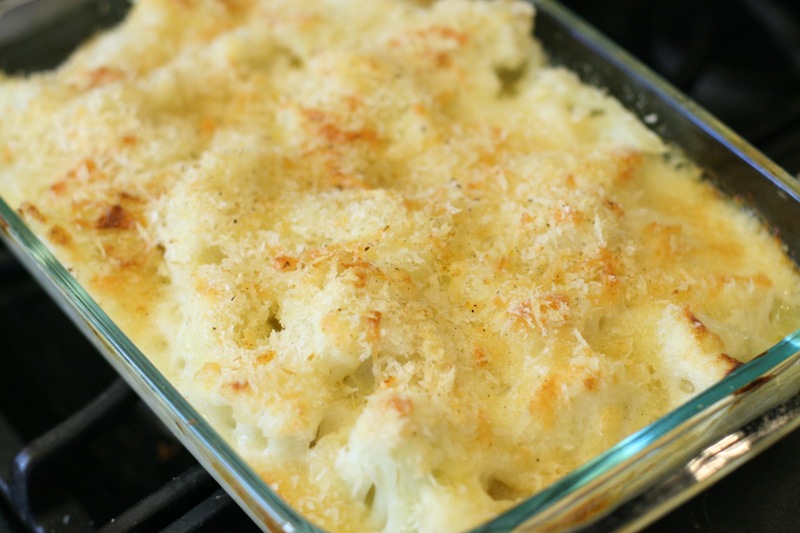 But seriously, LOOK at this Cauliflower Gratin. Since I followed Ina’s recipe down the line, just click HERE for the full recipe. Only thing I added was a little lemon zest in my bread crumb mixture. Oh, and I used panko instead of bread crumbs (didn’t realize I was out of bread crumbs until I was halfway through the recipe). I love your idea of adding lemon zest to the crumbs. I think that takes this veggie dish to a new taste level. Sounds great! Thanks! Lemon zest with panko or breadcrumbs on fish is great too!